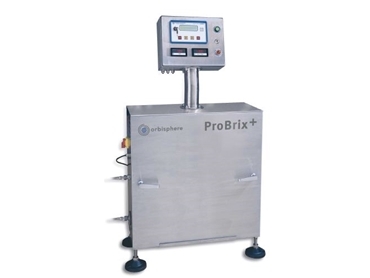 ORBISPHERE, represented by Pryde Measurement , has released the ProBrix beverage process analyser. The instrument combines sensor technology with a Windows-operated PC for fast and accurate simultaneous CO2, O2 and OBrix/%Diet measurement and display. Up to four measurements can be displayed on a single PC. The analyser stores up to 98 customer defined product characteristics such as targets, margins, units, etc. Accuracy of measurements is within ±0.006% V/V of CO2, ±1ppb of O2, 0.02° Brix and 2% Diet. The ProBrix features a start-up time of typically 60 seconds and therefore minimises product waste. A PC-based Windows operator interface enables product change-over, data acquisition and statistical analysis for up to four beverage lines simultaneously. The analyser's RS485 interface permits the PC to be located at distances up to 1km from the process line.